Your Hyundai-Kia spindle is in expert hands with our factory-trained technicians here at High Speed Technologies, Inc. We have repaired many Hyundai-Kia spindles to original factory performance. Need it fast? Why not take advantage of our Quick Turn Around (QTA) service! All Hyundai-Kia repairs are also backed by a 1 Year Warranty and our 30-year reputation of OEM-quality spindle repair. The Hyundai-Kia VX-400 spindle pictured above was sent in to us from a customer out of North Carolina who specializes in the repair & mfg. of parts for new and obsolete machinery. 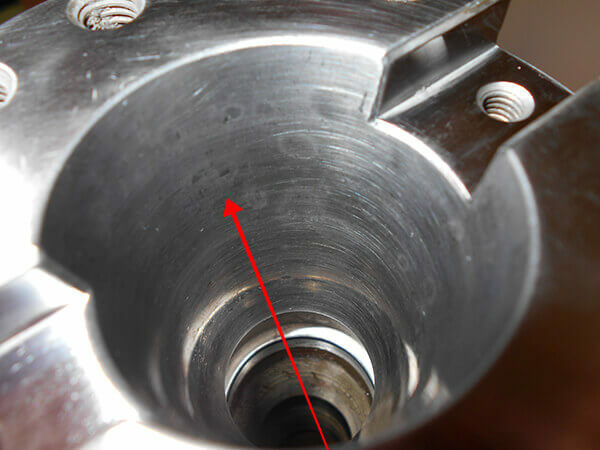 They stated that the spindle still ran OK at higher speeds but felt that a bearing in the lower end of the spindle was on the edge of failure. So they shipped it to our facility. Their Hyundai-Kia spindle arrived at our facility in short order and we immediately entered it into production. At this point the shaft was seized and could not be rotated by hand. After carefully dismantling the spindle we found the cause of the seizure; the #1 and #2 bearings had failed catastrophically and the broken pieces of ball cage locked the shaft up solid. The bearings were too badly damaged to determine the exact cause of failure. However, there were strong indications of particulate contamination resulting in bearing damage. There was also some fretting observed on each bearings inner race which is typically indicative of excessive vibration toward the end of the bearings life. The runout measured at the shafts taper ID was within specification. But because of the wear marks observed we decided that it would be best to kiss grind it for best tool to taper ID fit. After we restored this shaft surface it was nearly perfect. We measured 5 microns at the end of our 300 MM test bar. It’s difficult to do much better than that. With our certified test bar and air gauge, we could say this taper was near perfect! We replaced all bearings in kind with top of the line NSK super precision bearings. We also replaced all seals and rebuilt the drawbar. The customer asked us to re-use the gripper because it was relatively new. We were happy to do so. After test running the spindle and trim balancing it at max speed (12,000 RPM), it ran excellent! We test ran it for over 8 hours here on our test station so that the customer could plug it into their machine and start immediately. This spindle has been in operation for over four years and still going strong! For expert Hyundai-Kia spindle repair, please email or call us at 603-483-0333 for a free, no obligation quote. We offer one-year warranty and Quick-Turn-Around. We are fast, experienced and our work is guaranteed! !